In the summer of 1970, Pittsburgh Pirates right-hander Dock Ellis' tossed a no-hitter in a 2-0 victory over the San Diego Padres. But according to Ellis, the real feat wasn't silencing the Padres' bats; it was doing so while under the influence of LSD. If you're looking for footage of the fabled game, you're not going to find it  no tape has ever surfaced, and Major League Baseball hasn't rushed to dig through its archives for documentation of the psychedelic affair. 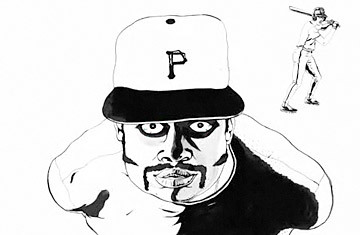 But animator James Blagden has created something arguably better: a black-and-white short film to accompany Ellis' own account  taken from a 2008 interview with American Public Media  of his trippy day on the mound. The video's minimalism makes way for Ellis' rich retelling of the story. The middling hurler  whose career record stands at 138-119  claims he dropped acid not knowing it was a game day, and took the hill despite being "high as a Georgia pine." He tells viewers about imagining Jimi Hendrix in the batter's box, Richard Nixon calling balls and strikes and coping with a ball that constantly shifted in size. But despite these drug-induced hallucinations (and eight walks), Ellis stifled the Padres, striking out six. It may not be an achievement Major League Baseball is eager to commemorate, but Ellis would likely find Blagden's cartoon tribute enough. He died in 2008, after retiring from the major leagues to become a career drug counselor in Los Angeles. See TIME's all-star movie baseball team.